Ronda Rousey signed her WWE contract on Sunday night, but not before there was a little drama. The final Raw-exclusive brand pay-per-view took place Sunday night as WWE presented Elimination Chamber from the T-Mobile Arena in Las Vegas. It’d be an historic night as it was the site for the first-ever Women’s Elimination Chamber match that’d feature the RAW Women’s Championship being defended. It was also the first time seven participants would compete inside the Chamber as the men’s match would feature seven superstars vying for the WWE Universal Championship at WrestleMania. There were some good moments and bad, so let’s get right to it. Always need a little filler! With the now full-fledged babyfaces in Gallows and Anderson really getting over their “NERDS!” spiel to the masses, it wasn’t exactly a surprise the babyfaces would go over in this match. I thought pairing Dallas and Axel with The Miz would be great for the them in terms of the tag team division, but it’s pretty clear they have no path to the Raw Tag Team Titles any time soon. Gallows and Anderson… maybe. The duo hit the Magic Killer on Axel for the win. After the match, The Revival was interviewed backstage and just kept rambling a little too long. I’m assuming we’ll see this feud play out next. Bayley and Deville started the match and basically just waited on saving the good stuff for later. Bayley did land an elbow drop on the outside to Deville. Shortly after, Rose entered the match, giving Absolution the dreaded two-on-one advantage. Bayley held her own for a few moments, but the numbers caught up to her. Deville speared Bayley on the outside of the ring and her and Rose really hammered down on Bayley. Five minutes later, Bayley’s “best friend” entered the fray. After a few good spots, Banks locked in the Bank Statement on Rose. With Deville trying to save her partner, Bayley interjected and tackled her. Rose wound up tapping out, being the first eliminated from the match. James entered the match shortly after. The highlight of her stint in the match besides her sweet ring gear was a semi-Lou Thesz press jump from the top of one of the pods onto Deville. She would pin her and both members of Absolution were thus eliminated. James wouldn’t last much longer, however, and was eliminated after a combination backstabber by Banks and Bayley-to-Belly suplex by Bayley. Bayley and Banks then waited for Bliss to be released from her pod as the match came down to those three. Once the door opened, Bliss quickly shut it in order to avoid both Bayley and Banks. Eventually she came out and tried to climb up the Chamber to avoid them, but they followed. She then tried climbing back down, so her adversaries did. They finally caught up to her, but not long after, Banks made a business decision and kicked Bayley off the pod to send her crashing down. While it didn’t happen near the end of the match and wasn’t one of those heel turns that the audience has become accustomed to seeing, it was still a pretty neat moment that’s been building for a while, and even happened at the Royal Rumble in Philly in January. Bayley and Banks began sparring, with Bliss waiting in the wings biding her time. Bliss hit Bayley with a superplex while Banks was in the Tree of Woe. Banks tried to hit a frogsplash on Bayley, but it turned out just to be a regular splash off the top rope. It still looked pretty sweet. Bayley wouldn’t stay down for the count, however. Moments later, Bayley hit the Bayley-to-Belly on Banks, but Bliss came in and rolled up Bayley for the pin. She then tried to pin Banks, but Banks kicked out. The two would fight some more, and cap it off with a great spot where Bliss hit Twisted Bliss from the top of the pod to the outside. Banks rolled over and locked in the Bank Statement, then rolled back in the ring. Bliss didn’t tap out, however, and eventually broke the hold. Banks tried going to the top of the pod, but Bliss cut her off and slammed her into the pod. She then set her up for a DDT off the top rope and pinned her to retain her championship. After the match, Bliss gave what appeared to be a heartfelt promo to all the girls in the audience, telling them to dream big as she was fighting back tears. But then she turned right back into heel mode, telling the entire audience that nobody would accomplish their dreams. As far as Bliss’ career on the main roster, I fail to see any women’s wrestler who’s had a better run than her these last two years. She’s been absolutely spectacular. This match was pretty shoddily put together, and there really wasn’t great buildup to this. It was an okay match, but didn’t really have great spots or great wrestling. I never expected it to, but there’s literally nothing else to write about this. The Bar retained. WWE’s done a good job on television leading up to this match of making some think Jax had a good chance to be the first one to ever beat Asuka in WWE. Jax hit some good moves on Asuka, and even accidentally landed on her legs when Asuka was supposed to roll completely out of the way. Asuka went for submission holds often, but Jax wouldn’t tap. Instead of having Jax tap out to Asuka, they had another roll-up finish. After the match, Jax attacked Asuka, eventually driving her through the ringside barricade. That’s not what the decision-makers want to hear when the Internet darlings are inside a WWE ring. However, it happened again, and it seems like a lot of WWE audiences just don’t get it. Or they just don’t care. Maybe they think they’re sending a message to WWE’s decision-makers, but I’d be hard-pressed to think crapping on two of the guys most fans adore is the way to go. Now, this feud has fallen pretty flat and didn’t give us much throughout the last couple of months, so hopefully that’s the end of that. Hardy hit the Twist of Fate for the pin. Triple H, Raw commissioner Stephanie McMahon and Raw general manager Kurt Angle all came out to introduce “Rowdy” Ronda Rousey. After Triple H spent a few minutes building her up, Rousey came out to a lot of boos and some cheers. I guess Vegas isn’t a fan anymore. Rousey didn’t exactly light it up on the mic, but I’m not too sure many expected her to. While she’s wanted to be a WWE superstar for a long time, it’s not that easy to just come in and learn everything even in the span of a few months. While her speech was a bit of a letdown, the crowd began chanting loudly for her and the moment got to her. She got a little emotional before saying “Rowdy” Roddy Piper was her inspiration and wants to make him proud. Triple H mentioned she didn’t want any special perks in her contract and she agreed, saying she wanted to be treated just like everybody else. Angle was asked if he had anything to say, and he didn’t hold back anything at all. Rousey stalked McMahon in the ring while Triple H hurried back to try and restore peace. As Triple H got McMahon out of the ring, he approached Rousey, who put him through the table. 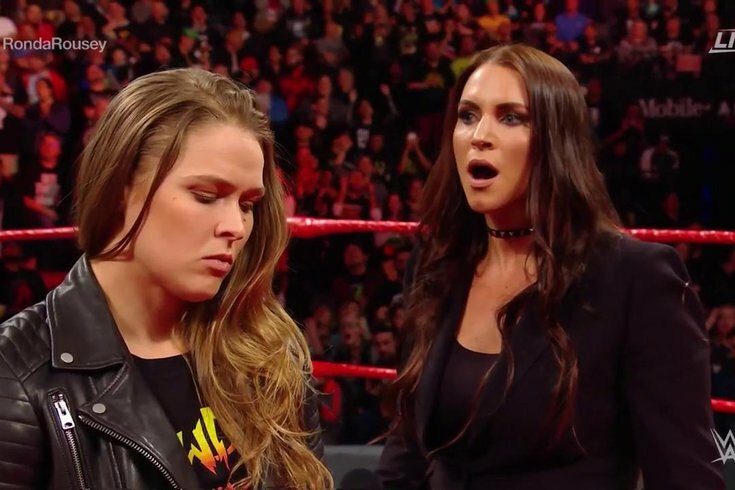 McMahon got in the ring and slapped Rousey, realized what she did, and left the ring looking scared. Rollins, Bálor and The Miz started the match. Good stuff. Cena was in next and went right to Rollins’ face. More good stuff. Reigns entered next. There’s a theme here – not much going on in terms of action and just biding time until everyone got in. Or at least until Strowman got in, because he was next. Miz tried to run away from Strowman, but The Monster Among Men caught up to him on top of one of the pods. He slammed him repeatedly into the glass, then threw him off onto the pile of wrestlers inside the ring. A few minutes later, Strowman eliminated Miz with a powerslam. Elias was released from his pod shortly after and was the final one to enter the match. The rest of the bunch gave a Shield-like powerbomb to Strowman, but he kicked out. Then, Cena hit Strowman with an Attitude Adjustment, but Strowman kicked out again. Strowman rolled outside the ring, but Bálor hit him with the Coup de Grâce. However, Strowman wouldn’t stay down for long. He eliminated Elias with a powerslam. He then eliminated Cena with a powerslam a couple of minutes later. Bálor hit Reigns with the Coup de Grâce., but Strowman didn’t allow the pinfall on Reigns. He grabbed Bálor and pinned him after a powerslam to eliminate him from the match. So, it came down to Strowman, Rollins and Reigns. Strowman eliminated Rollins with another powerslam. He almost did the same to Reigns, but The Big Dog countered and hit him with a Superman Punch and a pair of spears to finally put the monster down. Reigns will take on Brock Lesnar for the WWE Universal Championship at WrestleMania. After the match, Strowman attacked Reigns and threw him through the glass of one of the pods.